In an update to yesterday’s story about the dopey thieves who mistakenly snorted the cremated remains of a man and two dogs, Florida police this morning recovered most of the ashes from a lake where suspects admitted dumping the remains. 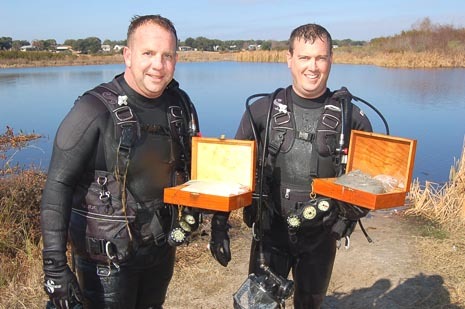 As seen in the above photo (click to enlarge) released by the Marion County Sheriff’s Office, divers recovered two wooden boxes from Magic Lake in Silver Springs Shores. The boxes contained the remains of burglary victim Holli Tencza’s father and one of her Great Danes. The man’s ashes had been in an urn, but “the suspects unknowingly put the victim’s father’s ashes in one of the wooden boxes and a dog’s ashes in the father’s urn,” according to investigators. Detectives are still searching for the urn holding the second dog’s remains. While the recovered remains were fished from a lake, they appear to have remained intact thanks to the plastic bags in which they were stored, according to another photo released by probers. As seen below, video of the recovery of the remains was also released by sheriff’s officials. Submitted by donji on Fri, 2011-04-08 19:53.
some crimes and criminals are just too stupid for jail .Just having people know your this stupid is punishment enough i'd say! Submitted by datdemdar on Fri, 2011-01-21 13:21. Keith Richards move over - there's some new kids in town. Submitted by Smokey on Fri, 2011-01-21 12:22. Cremating a dog is creepy enough, but holding onto the ashes is even more ridiculous. Submitted by stoopid on Fri, 2011-01-21 14:23.